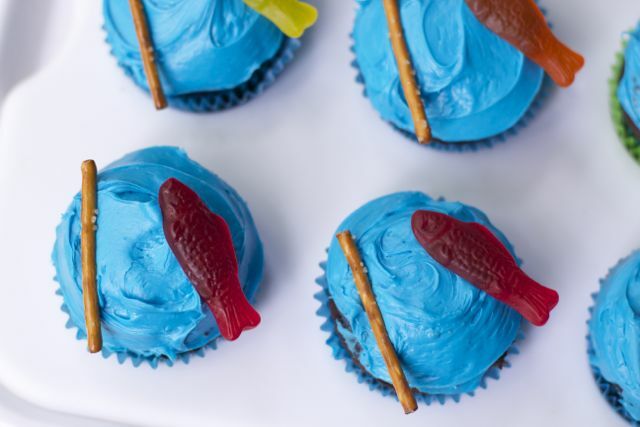 Updated this post about from my 2nd son’s fishing birthday partyFishing Birthday Party Cupcakes and Snack Ideas in June 2016. 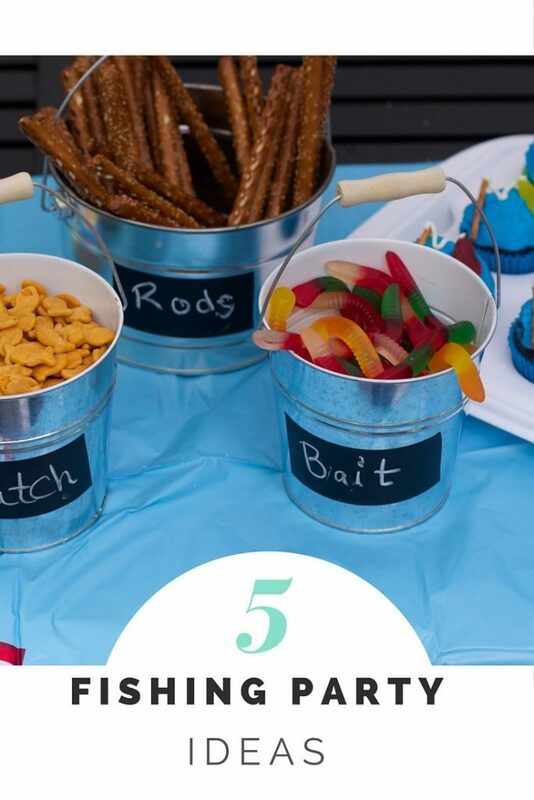 My kids are getting to the age that I can no longer do the cutesy themed birthday parties I so love doing. For my 9-year-old, this will be his last big party and then it will be just a few kids over for dinner and movies from here forward. 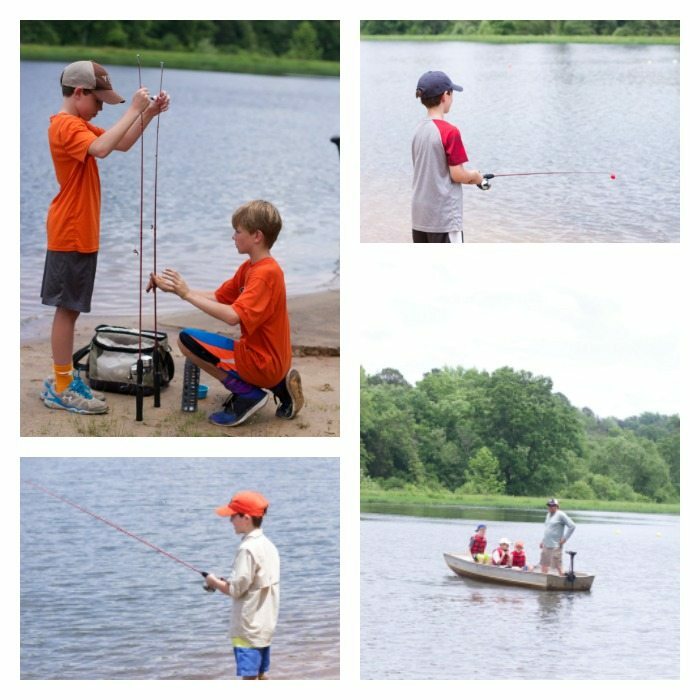 My son loves fishing so when I found a local company that picks up the kids from my house, takes them to a private lake with all the equipment and all I had to do was pack a cooler, send cupcakes and my husband, I was all over it. 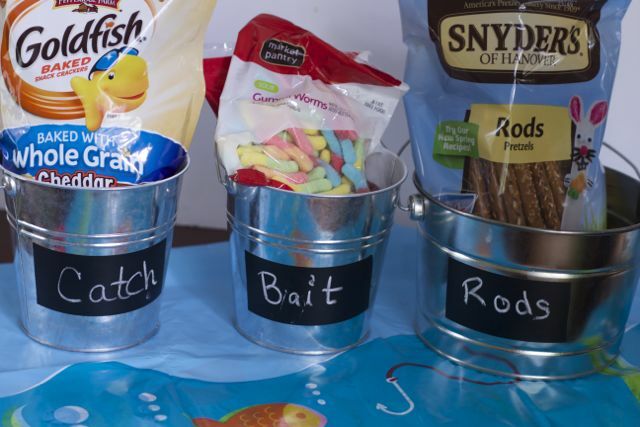 However, for my second son, my husband was not going to be there so I added a few new fishing party ideas. I made simple Evite invitations since we were at a new school and it just seemed easier to track down emails vs. addresses. I let my son find his own invite online they had some decent ones that set up the theme. For the second party I used a picture of my son with a recent catch. So now I had to get my hands into this party somehow. Becoming totally hands off is not me, so I wanted to squeeze the most I could into this otherwise hands off party. 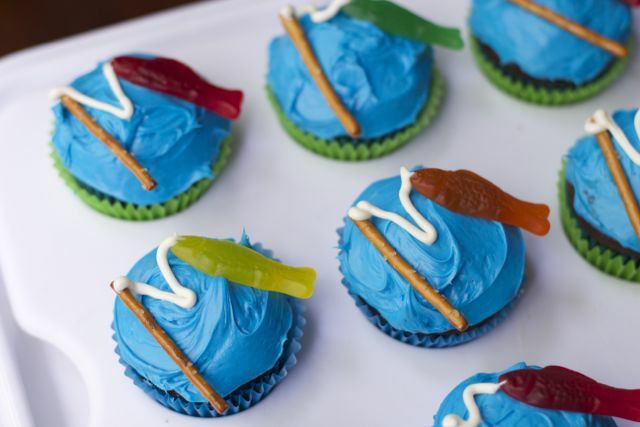 I searched Pinterest and the Internet for cake and cupcake ideas. I created my cupcakes by using a few of the ideas together. 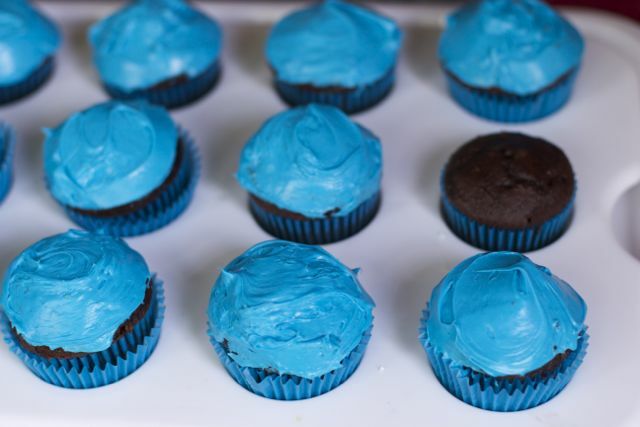 These cupcakes are pretty easy and I cheated by buying the pre-colored blue frosting… No judging please. The previous time I used goldfish, this year I decided to use colored Swedish Fish. Thought they would not get soggy like the goldfish did. Long Pretzel sticks make great rods. 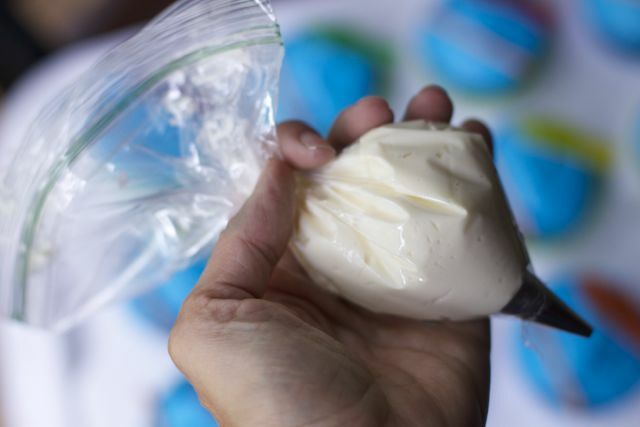 Using white frosting in a bag with a small frosting tip. I had run out of pastry bags so I used a ziploc. Knowing these were going to travel in a van of 12 kids I kept it simple but I still think they came out pretty well. Ten year old boys get hungry, so I knew I had to send some snacks. I had to make them go with the theme too. I know they would not get the full effect of this but I had to add some bait. 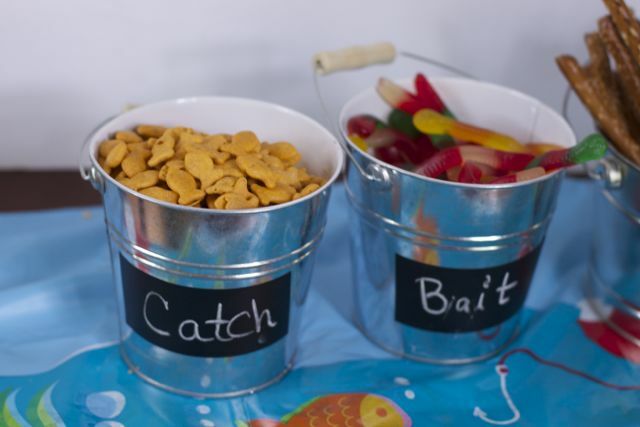 I put a strip of chalk duck tape on those inexpensive steel pails so I could reuse them. let me see what the problem is. 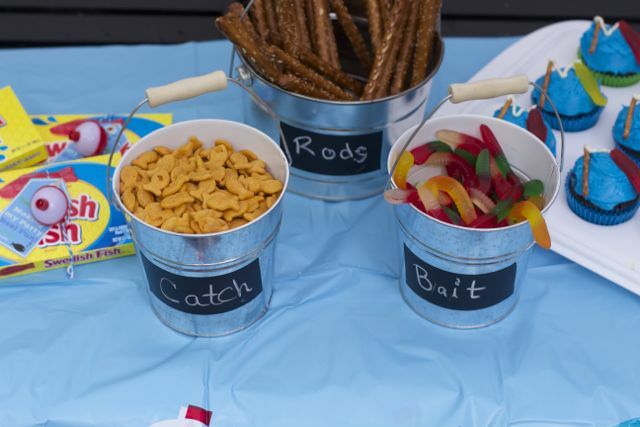 Love the fishing party ideas. I don’t see the printable thank you fishing tag? 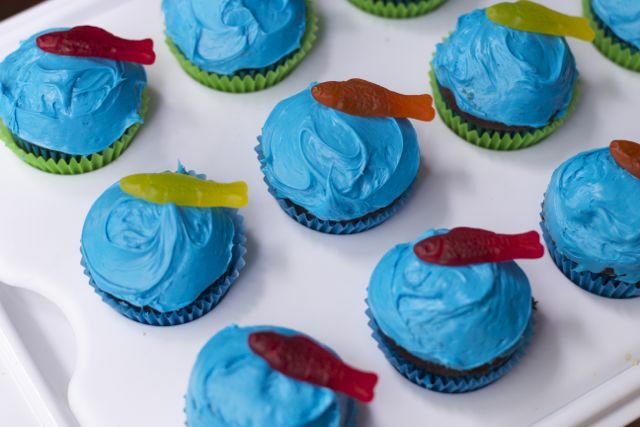 I absolutely love what you did with the swedish fish!